Wrought iron loves the light doesn’t it! Beautiful Joe! oh yeah, i am loving this! Two thumbs up for wrought iron! Such a pretty scene, especially with the shallow DOF. Love it, Joe! Wow. Love the depth of field. That 56 mm is great. And you’re not so bad yourself. As a photographer, I mean! Very pretty Joe! Reminds me of an English Garden and Spring! 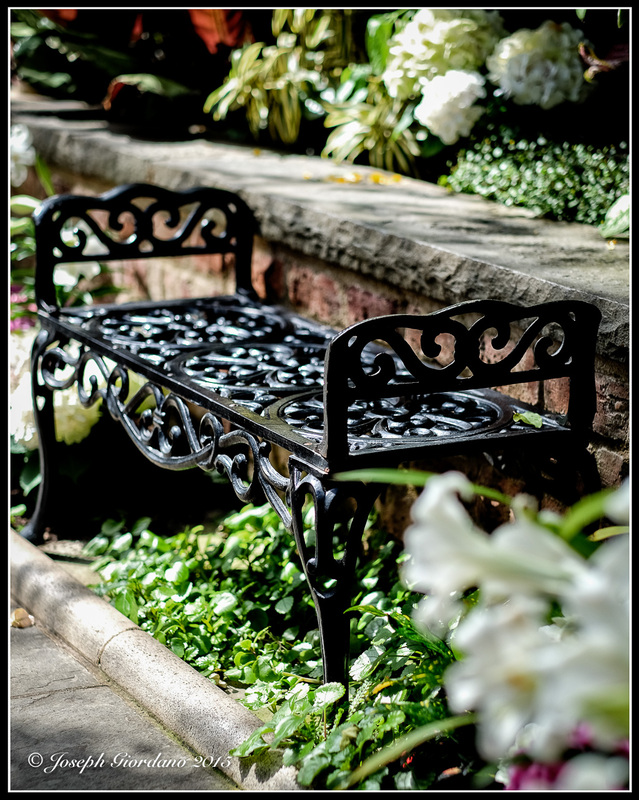 A beautiful place to sit and enjoy the beauty of all the lovely flowers. I can almost hear the sounds of the songbirds in the background. Very peaceful and relaxing! Sunday night late on west coast and I don’t see any image here, Joe. Just thought you’d like to know. Darn I love wrought iron! Hmm…not sure why it wasn’t loading for me… glad it’s Ok.